We have a lot of really cool and interesting creatures that live in our bay, but one many may not know about is a small turtle known as a diamondback terrapin. Terrapins are usually associated with the Chesapeake Bay area, but actually they are found along the entire eastern and Gulf coast of the United States. It is the only resident turtle of brackish-estuarine environments, and they are really cool looking. The diamond in the marsh. The diamondback terrapin. Terrapins are usually between five and 10 inches in length (this is the shell measurement) and have a grayish-white colored skin, as opposed to the dark green-black found on most small riverine turtles in Florida. The scutes (scales) of the shell are slightly raised and ridged to look like diamonds (hence their name). They are not migratory like sea turtles, but rather spend their entire lives in the marshes near where they were born. They meander around the shorelines and creeks of these habitats, sometimes venturing out into the seagrass beds, searching for shellfish – their favorite prey. Females do come up on beaches to lay their eggs but unlike sea turtles, they prefer to do this during daylight hours and usually close to high tide. Most folks living here along the Gulf coast have not heard of this turtle, let alone seen one. They are very cryptic and difficult to find. Unlike sea turtles, we usually do not give them a second thought. However, they are one of the top predators in the marsh ecosystem and control plant grazing snails and small crabs. 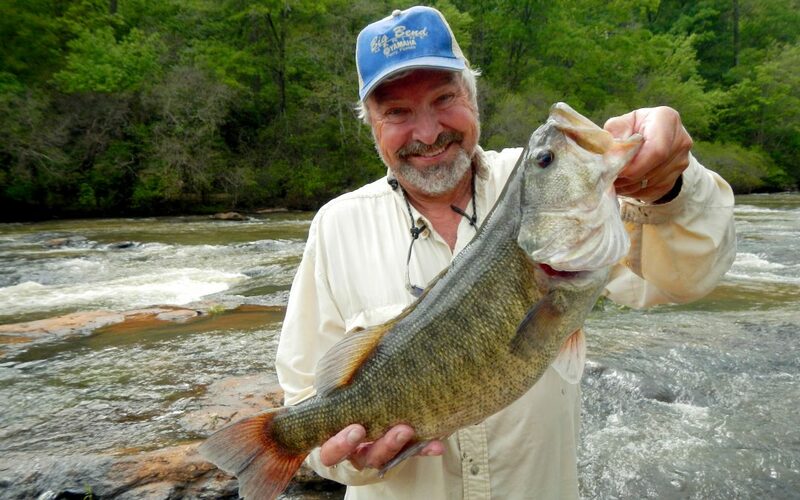 During the 19th century they were prized for their meat in the Chesapeake area. As commonly happens, we over harvested the animal and their numbers declined. As numbers declined the price went up and the popularity of the dish went down. There was an attempt to raise the turtles on farms here in the south for markets up north. One such farm was found at the lower end of Mobile Bay. Early 20th century still found terrapin on some menus, but the popularity began to wane, and the farms slowly closed. Afterwards, the population terrapins began to rebound – that was until the development of the wire meshed crab trap. Developed for the commercial and recreational blue crab fishery, terrapins made a habitat of swimming into these traps, where they would drown. In the Chesapeake Bay area, the problem was so bad that excluder devices were developed and required on all crab traps. They are not required here in Florida, where the issue is not as bad, but we do have these excluders at the extension office if any crabber has been plagued with capturing terrapins. Studies conducted in New Jersey and Florida found these excluder devices were effective at keeping terrapins out of crab traps but did not affect the crab catch itself. Crabs can turn sideways and still enter the traps. 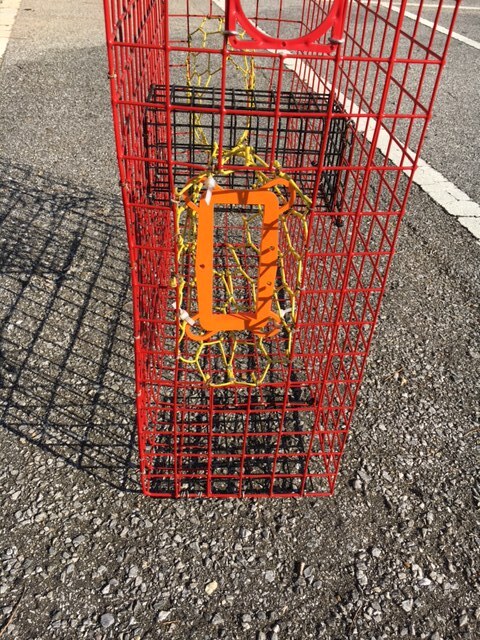 This orange plastic rectangle is a Bycatch Reduction Device (BRD) used to keep terrapins out of crab traps – but not crabs. Another 20th century issue has been nesting predation by raccoons. As we began to build roads and bridges to isolated marsh islands in our bays, we unknowingly provided a highway for these predators to reach the islands as well. On some islands, raccoons depredated 90% of the terrapin nests. Today, these turtles are protected in every state they inhabit except Florida. 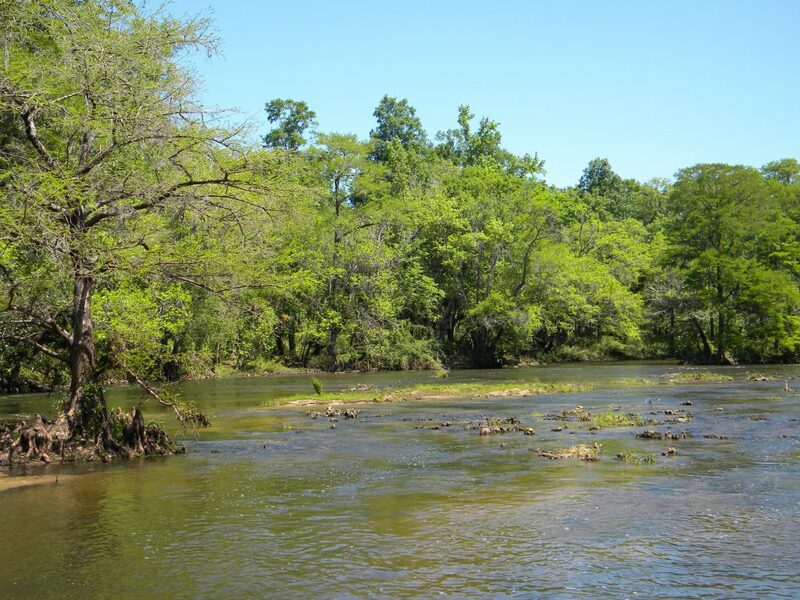 Though there is currently no protection for the terrapin itself in our state, they do fall under the general protection for all riverine turtles; you may only possess two at any time and may not possess their eggs. 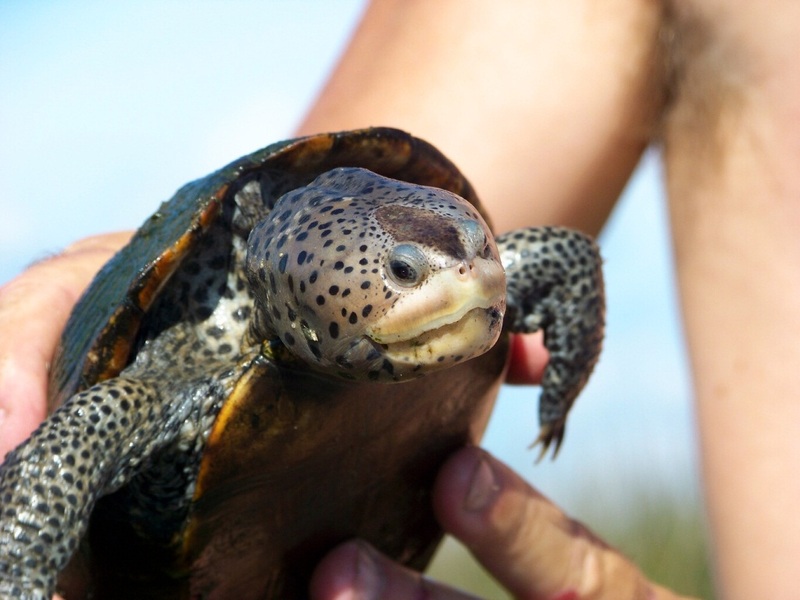 Some scientists have discussed identifying terrapins as a sentinel species for the health of estuaries. Not having terrapin in the bay does not necessarily mean the bay is unhealthy, but the decline of this turtle (or the blue crab) could increase the population of smaller plant grazing invertebrates they eat throwing off the balance within the system. Sea Grant trains local volunteers to survey for these creatures within our bay area. Trainings usually take place in April and surveys are conducted during May and June. This year we will be training volunteers in the Perdido area on April 10 at the Southwest Branch of the Pensacola Library on Gulf Beach Highway. That training will begin at 10:00 AM. For Pensacola Beach the training will be on April 15 at the Navarre Beach Sea Turtle Conservation Center on Navarre Beach. That training will begin at 9:00 AM. A third training will take place on April 22 at the Port St. Joe Sea Turtle Center in Port St. Joe. 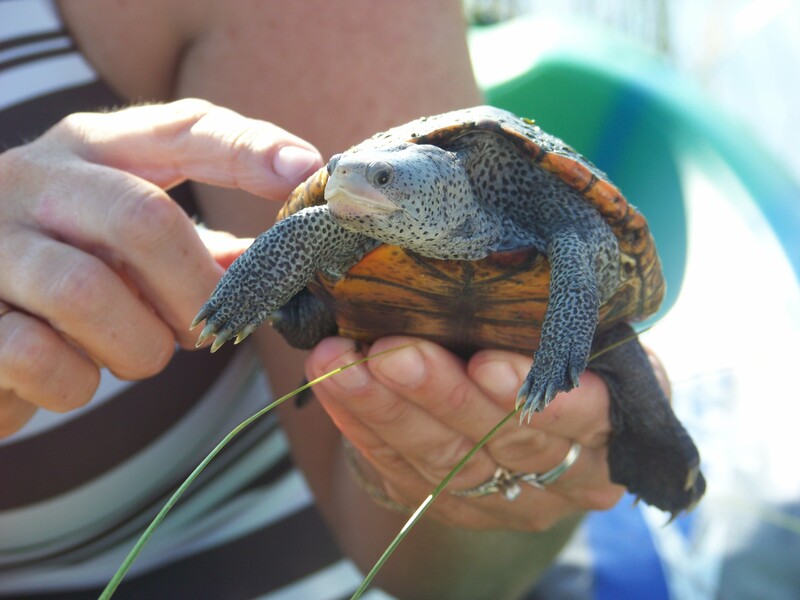 For more information on diamondback terrapins contact me at the Escambia County Extension Office – (850) 475-5230 ext. 111. 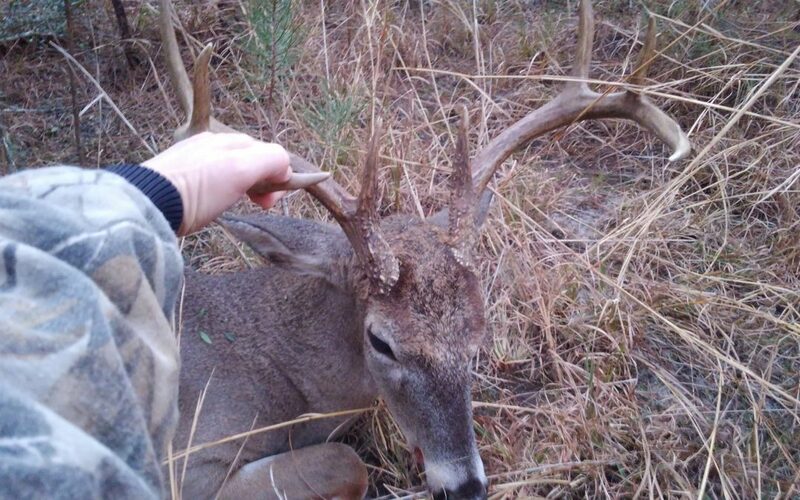 This time of year in Northwest Florida, deer hunters are busy talking about the rut! What’s the rut, you might ask? Simply put, it’s deer breeding season. Deer hunters speculate on peak rut times each year. There are even peak rut forecasts. Why are hunters interested in deer rut? Hunters know that bucks are more active and careless during the rut. Bucks exhibit four rut behaviors: sparring, rubbing, scraping, and chasing. Sparring happens between bucks to establish dominance. 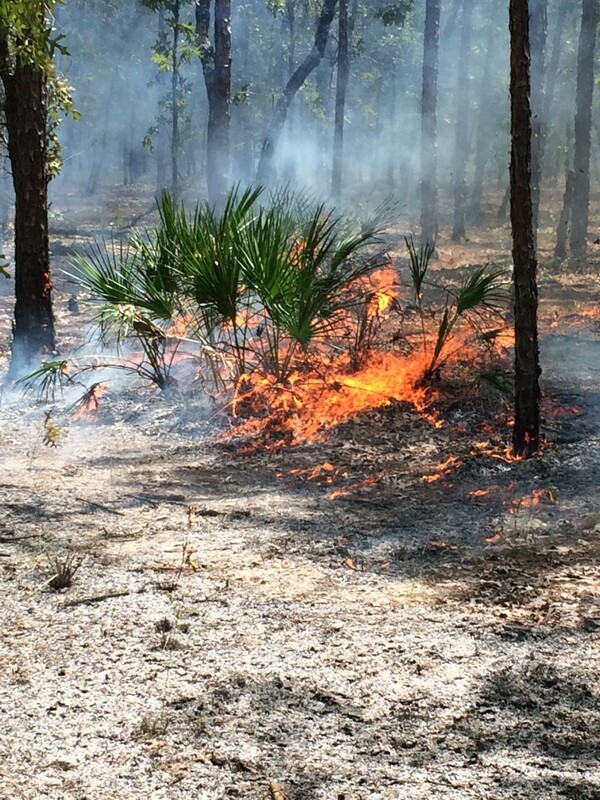 This happens during the pre-rut. 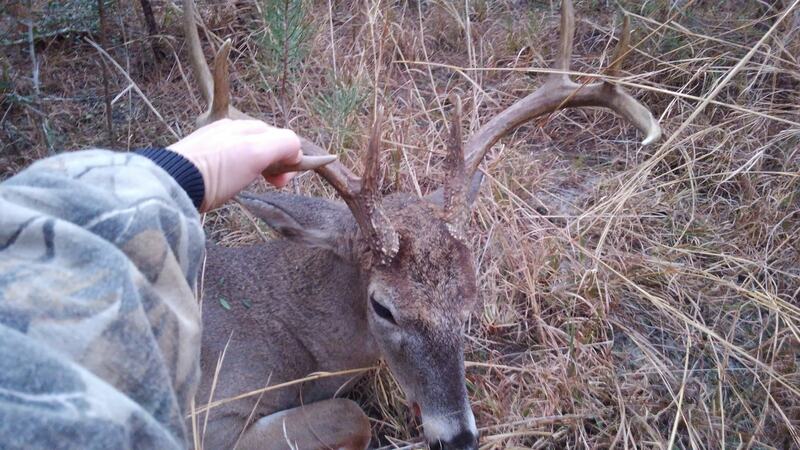 Dominant bucks are generally the ones who get the does. Bucks also make rubs on trees during the pre-rut period. They start this behavior to remove velvet from their antlers. They continue rubbing to mark their territory with their scent. Scraping is another way they mark their area. A scrape normally occurs under a low hanging branch. The buck will lick or chew on the branch while scraping the ground as well as urinating on the ground. The last rut behavior is chasing does. Does typically won’t be game for this unless they are ready to breed. In other parts of the country, the rut is long over. Even in other parts of Florida, it is over. 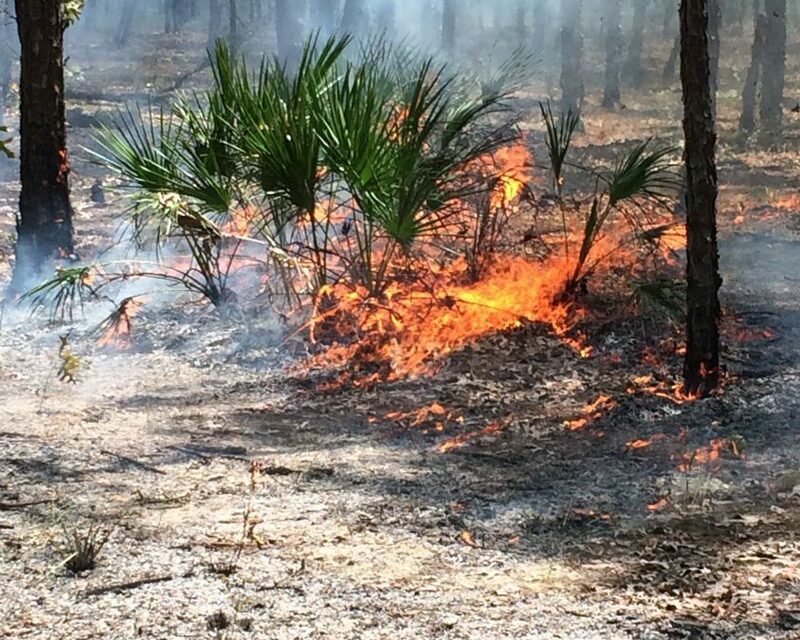 Florida has more variability in rut timing than in any other state. 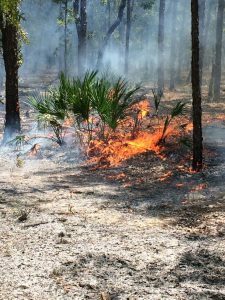 In Florida, deer rut starts in July in the southern part of the state and runs through February in the north. Deer breeding dates are more predictable in the northern U.S. where winters are too harsh for fawn survival. Deer breeding in our state is more variable because of our mild winters. Average breeding dates in Northwest Florida are very late compared to other parts of the country and the state. Our average breeding dates generally range from December to mid-February. Gestation takes about 200 days, so this puts fawning dates in late June through early September. Even though we have average breeding dates for our area, these aren’t “magical dates”. Not all does go into estrus on the same day or even the same week. 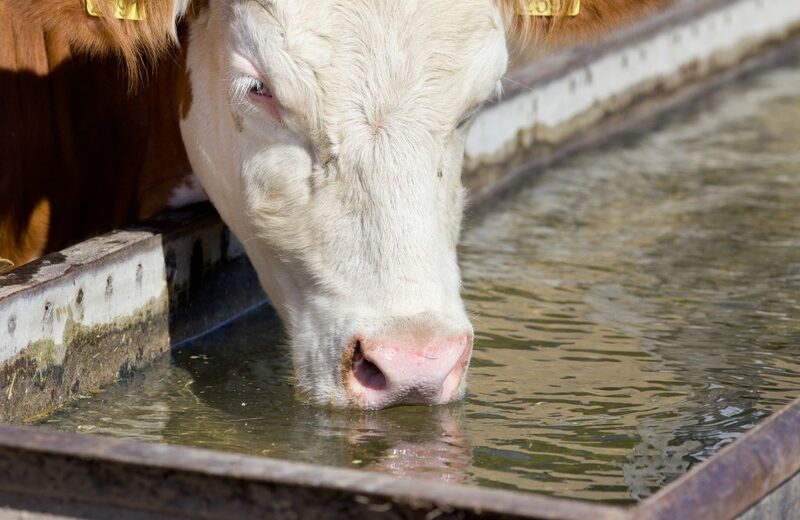 Estrus only lasts 24 hours and not all does become pregnant during the first estrus period. This means that about 28 days later does go into a second estrus. So the rut period is a range around the average date. So, to all my fellow hunters in Northwest Florida, enjoy the 2019 rut! I know I have enjoyed watching several bucks chase does as well as having the opportunity to take the biggest buck of my life this January. Good luck to you all in your hunting ventures! 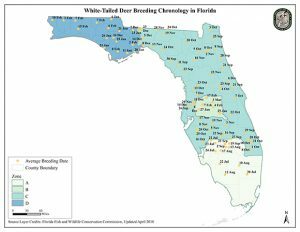 More information about the Florida Fish and Wildlife Commission Deer Breeding Chronology Study can be found at https://myfwc.com/hunting/deer/. As we begin our wildlife series for 2019, we will start with a snake that almost everyone has encountered but knows little about – the southern black racer. The southern black racer differs from other black snakes in its brilliant white chin and thin sleek body. This snake is common for many reasons. It can be found in a variety of habitats and is particularly fond of “edge” areas between forest and open habitat – they do very well around humans. The southern black racer (Coluber constrictor priapus) is one of eight subspecies of this snake found in the United States. This local variety is a beautiful shiny black. The shine is due to the fact that they have smooth, rather than keeled, scales. It is a long snake, reaching up to six feet, but very thin – and very fast! Most of us see it just before it darts away. They are sometimes confused with the cottonmouth. 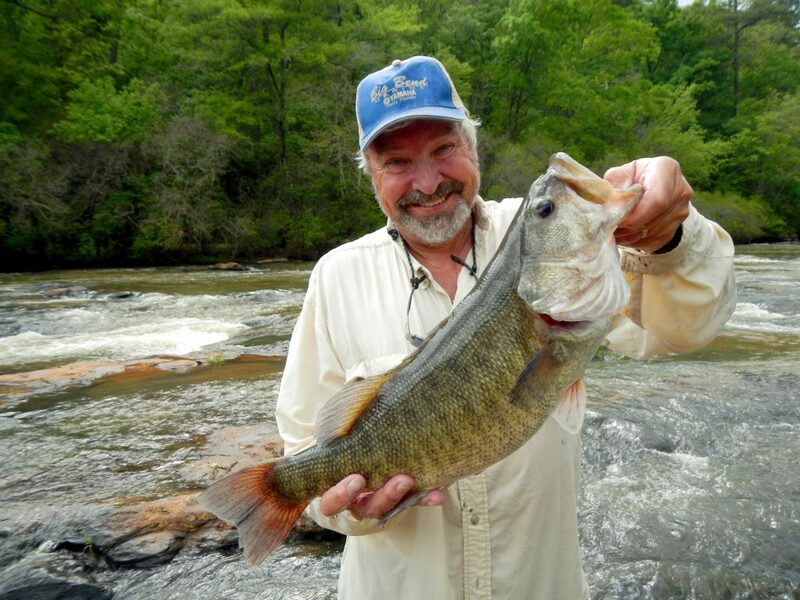 It can be distinguished in having a long “thin” body, as compared to the cottonmouths shorter “thick” body. It has a brilliant white chin and the top of the head is solid black. 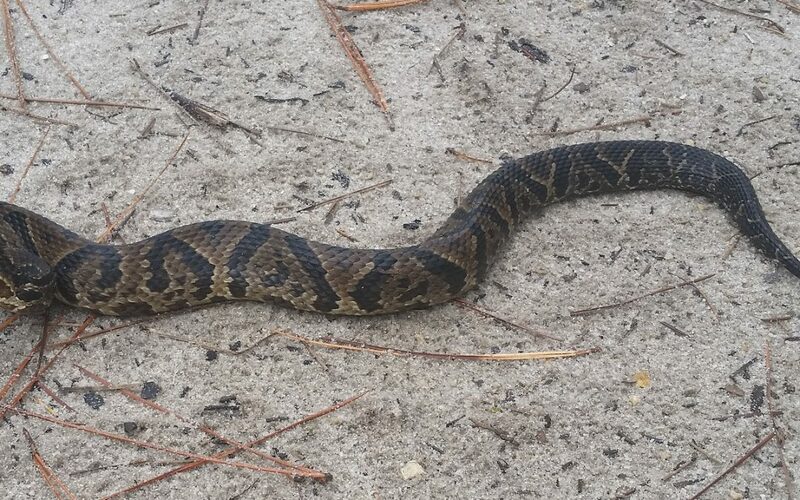 Cottonmouths can be mottled, usually have a cream-colored chin with a dark “mask” extending from the lower point of the chin through the eye. Cottonmouths also have the wide delta shaped head compared the finger-shaped head of the racer. They are also confused with the eastern indigo snake. The indigo is very long (up to eight feet) large bodied snake, and the lower chin is a reddish-orange color. The coachwhip is a close cousin of the racer, found in many of the same habitats. It has a similar body shape, and speed, but is a light tan color with a dark brown-black head and neck. 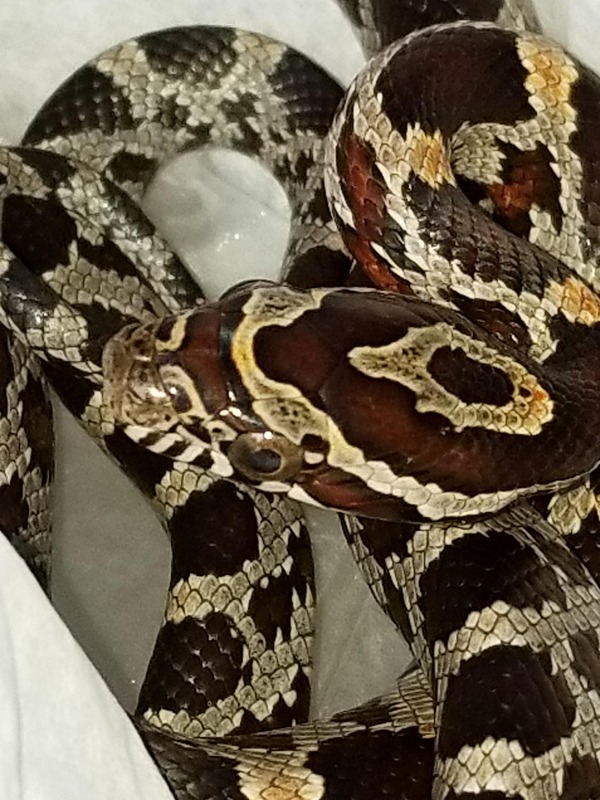 The juvenile black racer looks more like a corn snake, and is sometimes confused with a pygmy rattler. The juvenile looks nothing like the adult. The young racers hatch from rough covered eggs laid in late winter and early spring. They typically lay between 6-20 eggs and hide them under rocks, boards, bark, and even in openings in the side of homes. In late spring and early summer, they hatch. Their body resembles adults, but their coloration is a mottled mix of grays, browns, and reds – having distinct patches on their backs. This helps with camouflage but often they are mistaken for pygmy rattlesnakes and are killed. They are great climbers and are found in our shrubs and trees, as well as on our houses and in our garages. Though sometimes confused with the cottonmouth, this snake is non-venomous and harmless. Harmless in the sense that a bite from will cause no harm – but it will bite. Black racers are notorious for this. If approached, it generally freezes first – to avoid detection. If it believes it has been detected, it will flee at amazing speeds. If it cannot flee, it will turn and bite… repeatedly. Again, the bites are harmless, but could draw blood. Cleaning with soap and water is all you need. They are opportunistic feeders hunting a variety of prey including small mammals, reptiles, birds, insects, and eggs. They also hunt snakes, including small venomous species. Unlike the larger venomous snakes, black racers stalk their prey – many times with their heads raised similar to cobras. When prey is detected, they spring on them with lighting speed. Despite the scientific name “constrictor”, they do not constrict their prey, rather pin it down and wait for it to suffocate. They do have their predators, particularly hawks. When approached they will first freeze to avoid detection, they may release a foul-smelling musk as a warning, and sometimes will vibrate their tails. In leaf-litter, this can sound very similar to a rattlesnake – not helping with the juvenile identification confusion. One paper reported finding a dead great horned owl with a black racer in its talons. Apparently, the owl grabbed the snake too far back. It killed the snake but not before the snake was able to strangle the owl. 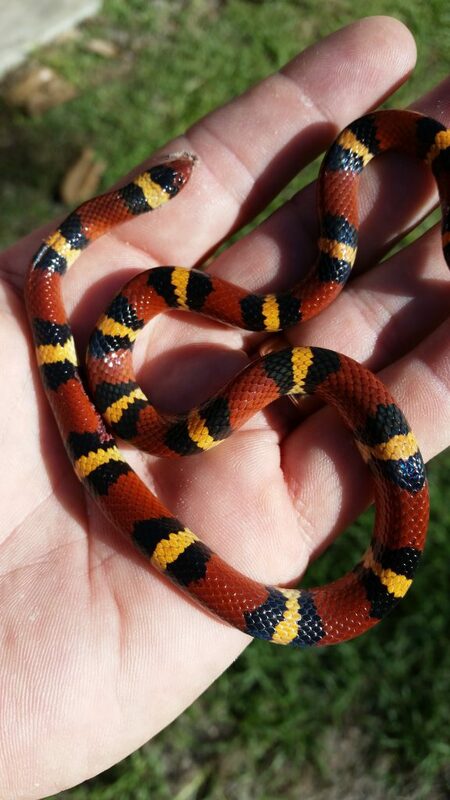 They are hibernating this time of year but will soon be laying another clutch of eggs and we will once again encounter this most common of snakes. Florida Museum of Natural History. 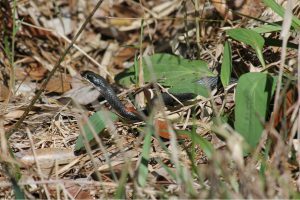 Southern Black Racer (Coluber constrictor priapus). http://www.floridamuseum.ufl.edu/herpetology/fl-snakes/list/coluber-constrictor-priapus/. Gibbons, W., M/ Dorcas. 2005. Snakes of the Southeast. University of Georgia Press, Athens GA. pp. 253. Perry, R.W., R.E. Brown, D.C. Rudolph. 2001. Mutual Mortality of a Great Horned Owl and a Southern Black Racer: a Potential Risk for Raptors Preying on Snakes. The Willson Bulletin, 113(3). http://doi.org/10.1676/0043-5643(2001)113[0345:MMOGH0]2.0.CO;2. Willson, J.D. Species Profile: Black Racer (Coluber constrictor priapus). SREL Herpetology. www.srelherp.uga.edu/snakes/colcon.htm.